With Christmas just around the corner, I figured it was time to spread a little holiday cheer around my apartment. Since I'm a little limited, when it comes to space, I decided to stick with my little table top tree, from last year, but that just wasn't enough. For me a Christmas, just isn't Christmas, without the scent of fresh pine and a pine scented candle just wont do. So I picked up some fresh garland from the local tree lot and got way more than I bargained for. In my head I just wanted a little, to put over the doorway, but after some persuasion from a very cheery, but persistent tree lot elf, I ended up hauling away 10 ft of garland. Hanging the garland, proved to be quite a cumbersome task for me and my little step latter. After a couple failed attempts, using everything from command hooks to Velcro, I finally gave in and used the good ol fashion hammer and nail method. ( ps. don't tell my landlord 😳). Once I finally got the garland up it was as time to decorate! I chose to go with natural glam theme and bought a set of mini metallic ornaments, a burlap bow, and some gold beaded garland from the Wondershop at Target. Christmas ornaments and gold beaded garland from Target and fresh garland on floor. But of course, it wouldn't be me if there wasn't some sort of DIY element to this project. 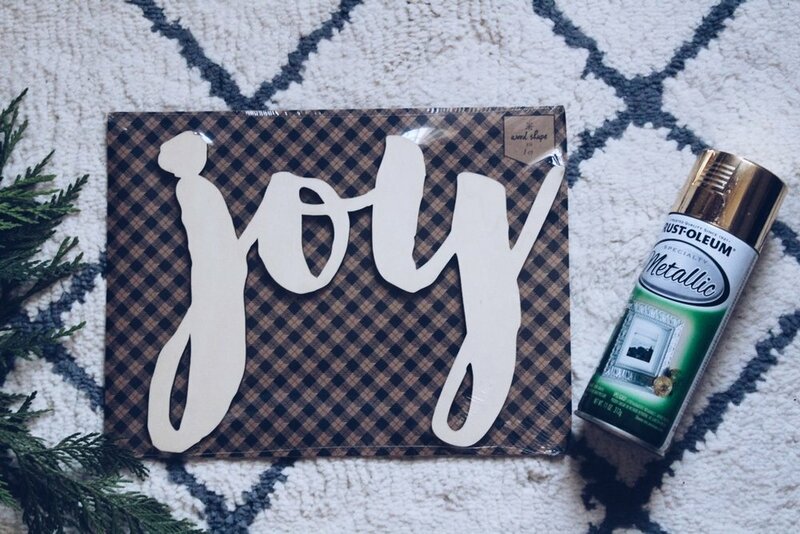 After a stroll through bullseye alley ( the section by the register, at Target, where almost everything is under 5 dollars) I found a wooden cut out of the word "Joy" and thought " This would look great, if it was gold and I could figure out a way to hang it!" ( This is where having multiple cans of gold spray paint and super glue come in handy). I decided to spray paint it gold and super glued the gold beaded garland, to the back, to hang it. With the addition of a few battery operated lights, my project was complete! 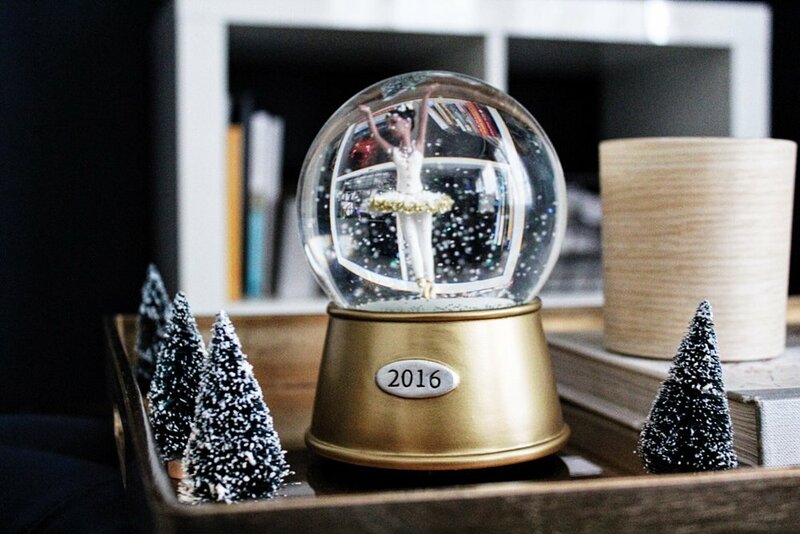 I also found these super cute snow-capped pine trees and a snow globe with a beautifully brown ballerina, who dances to the tune of the "Nutcracker Suite" and created a little winter Christmas magic on my coffee table. "May your day's be merry and bright.. and may all your Christmases be white"
Don't know what to do with those fallen Christmas tree branches? 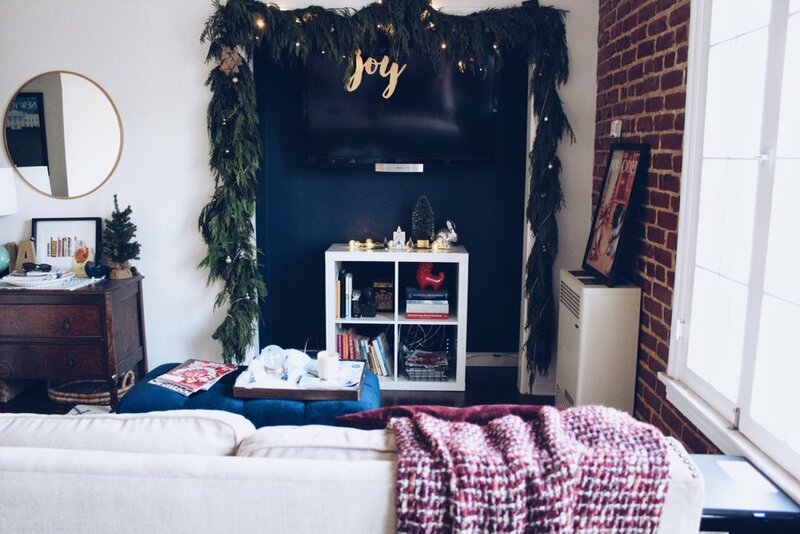 Check out this post for more holiday decor inspiration.